The big news from Isuzu Truck at the CV Show is the debut of its brand new Euro VI ‘Forward’ 12 tonner – the new F120.240 4x2 rigid featuring a compact overall footprint as well as a class-leading payload carrying capacity. Also making its debut is the Euro VI Isuzu ‘Urban’ N75.150 (E), short wheelbase chassis, featuring a Brit-Tipp all-steel tipper body that gives an overall payload of 3780kgs. This vehicle is part of a programme of pre-bodied Isuzu tippers that have full ECWVTA and are available off-the-shelf for customers that require a durable tipper, easily, quickly and conveniently. Completing the four-vehicle line-up for Isuzu inside this year’s CV Show are two Isuzu ‘Forward’ N75.190 (E) Euro VI rigids for two of the industry’s biggest names - Argos and HSS. Both vehicles feature Isuzu’s popular ‘Easyshift’ transmission. As one of an order for 66 new Isuzus, the Argos 7.5 tonner has an extended 5.3m wheelbase and is fitted with a demount body highlighting the new striking Argos livery. The HSS vehicle is part of a 19-strong order of Isuzus and is fitted with a drop-side body with a 2-tonne cantilever tail-lift. 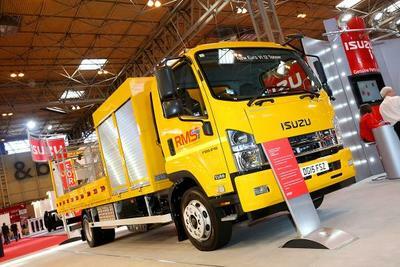 In the outside demonstration area of the CV Show, Isuzu Truck is exhibiting an additional fifth vehicle. This is another N75.150 (E) ‘Urban’ Euro VI short wheelbase rigid in the livery of SHB Hire and fitted with a Paneltex insulated box body, featuring a GAH refrigeration system. For 2015, Isuzu has also made some enhancements to its complete range of cabs including a new restyled chrome grille, a new driver’s suspension seat, factory-fitted red seat belts, a new steering wheel with standard SRS airbag plus a new interior trim and upholstery. Visitors to the show will be able to see these enhancements on the ‘Urban’ N75.150 (E) Brit-Tipp tipper bodied vehicle on Isuzu’s main inside stand. Making its first ever appearance is the new Isuzu F120.240 4x2 rigid and the vehicle is in the livery of Road Maintenance Services Ltd. This 12 tonner is one of a pair of Isuzu 12 tonne rigids that are due to go into service with the Cheshire-based road surface treatment company, just as soon as the CV Show is over. In line with all Isuzu’s 2015 product range, the 12 tonne rigid is really compact in size, with a low chassis height and offering great versatility. This particular truck offers excellent manoeuvrability and is specified with Isuzu’s Easyshift semi-automated transmission making it really easy to drive. With Isuzu’s Euro VI four-cylinder 5.2 litre diesel engine producing 240PS power and 765Nm torque, this engine really does give superb fuel economy and productivity. The Isuzu F120.240 Euro VI 4x2 rigid on display has a 4990mm wheelbase and features a multi-purpose, 4-section Brit-Tipp body designed for signage vehicle applications within the highways maintenance operation of RMS Ltd. With an overall body length of 7000mm, accommodating a high level of detail and features, this particular Isuzu 12t rigid has a payload of 6350kgs. “The RMS 12 tonne Isuzu clearly demonstrates the flexibility and versatility of the full Isuzu product range. Within this specification, the customer has been able to meet all operational requirements to cover the seasonal variations within its business needs, whilst retaining the prime benefits of payload, performance and long-term reliability – all of which are attributes long-associated with the Isuzu truck brand,” commented Keith Child. The second Isuzu rigid making its debut at the show is the Euro VI Isuzu ‘Urban’ N75.150 (E) short wheelbase chassis, featuring a Brit-Tipp, all-steel tipper body, offering a payload of 3780kgs. This vehicle is part of Isuzu’s ‘ready to go to work’ range of durable 7.5 tonne tippers. Powered by the turbocharged and intercooled, four-cylinder diesel, 3.0 litres, 150PS engine, the Isuzu ‘Urban’ tipper chassis offers both power and economy, and again features Isuzu’s semi-automated ‘Easyshift’ transmission. The Argos liveried Isuzu N75.190 4x2 Euro VI rigid on the stand is one of a 66-vehicle order placed by the retailer for delivery during 2015. Like all the vehicles on the Isuzu stand this year, this 7.5 tonne rigid features Isuzu’s increasingly-popular ‘Easyshift’ transmission. The current Argos home delivery operation utilises a lightweight 7315mm box-van body. To cater for this it means that the standard Isuzu 4475mm wheelbase is extended to 5300mm. Wheelbase Engineering then mount a lightweight demount frame to the chassis and this enables Argos to achieve maximum payload and loading efficiencies from this specialist chassis/cab and body combination. Long-term operator of Isuzu vehicles, tool and equipment hire company HSS has recently ordered a further 19 new Isuzu 7.5t rigids for its nationwide fleet. On display at the CV Show is one of these N75.190 (E) Euro VI vehicles - again specified with Isuzu’s ‘Easyshift’ transmission. With a payload of 3060kgs, this particular vehicle is fitted with an 18ft aluminium double drop-side body, with detachable pillars and a 2000kgs lifting capacity cantilever tail-lift at the rear. In the external demonstration area of this year’s CV Show, Isuzu Truck is also featuring an additional N75.150 Euro VI ‘Urban’ 4x2 rigid. This vehicle is specified with a 4.5m Paneltex insulated box-body fitted with a GAH J503 direct drive refrigeration system. With double rear doors and a pallet-width side door fitted to the nearside of the body, this vehicle is designed for carrying goods to an operational temperature of -18° C and has an impressive payload of 3100kgs. This particular refrigerated body is manufactured to ATP Class C standards and has a Dhollandia DHRC 1000kg rear tail lift. “The Isuzu 7.5t ‘Forward’ and ‘Urban’ rigids are the proven mainstay of our current range and the four examples on show at the CV Show clearly illustrate the versatility of our products. Although completely different body specifications, maximum payload carrying capacity is at the heart of the differing operations. Argos, HSS and SHB Hire each require maximum payload and a high degree of flexibility from their distribution vehicles. The Brit-Tipp bodied tipper offers durability as well as maximum payload carrying capacity. And our new 12 tonner has similar credentials. This is why the Isuzu marque ticks so many boxes for operators the length and breadth of the UK,” concluded Keith Child.